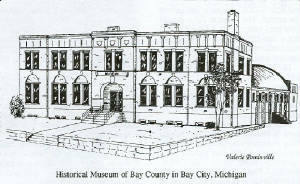 The Bay County Historical Society is a non-profit organization that manages the Historical Museum of Bay County and cares for the Trombley Centre House located in Veterans Memorial Park. The Bay County Historical Society and the Historical Museum of Bay County are housed within the former National Guard Armory. This building, constructed in 1910, has been the home of the Society since 1988. Previous locations include the halls of Central High School, the second floor of the Bay County Building and the Diebel Home at Center Avenue and N. Hampton Street. The business of the Society is under the direct supervision of a Board of Directors serving two three-year terms. ©Copyright 2016 by the Bay County Historical Society. Content and design by BCHS staff except where noted. All rights reserved. Written permission must be obtained for reprint rights.